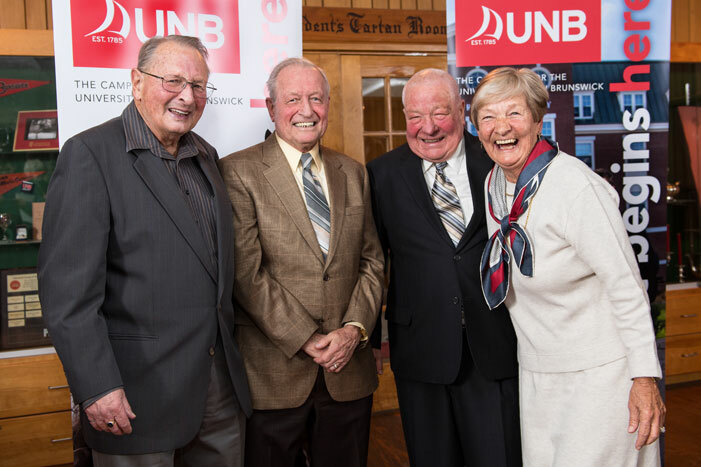 Siblings Bob, Tim, John and Iris Bliss were all active students when they attended the University of New Brunswick’s Fredericton campus in the 1950s – they participated in student societies and sports teams, and excelled academically. In the years since graduating, their ties to their alma mater have remained strong. From their support of athletics facilities and teams, to leadership with the Beaverbrook Scholars award committee, to service with the UNB Alumni Association and the UNB Board of Governors. It was Iris Bliss, however, who decided that it was time that the siblings did something as a family for UNB. With her encouragement, they each gave separately to one common initiative, creating a $300,000 scholarship endowment to help ensure that more students can come “up the hill” to receive a life-changing education at UNB. Three Bliss Family Scholarships, announced today during a ceremony at the Alumni Lounge on UNB’s Fredericton campus, will be awarded to students in the bachelor of science in engineering degree program while the fourth will be awarded to a student who has completed a bachelor of kinesiology at UNB and is beginning the bachelor of education program. This mirrors the Bliss family’s educational path – Bob (BSE EE ’52), retired engineer with Westinghouse, Tim (BSE CE ’54), retired vice-president of engineering with McCain Foods, John (BSE CE ’55), retired city engineer for Fredericton, and Iris (BSc ’57, BEd ’59), retired associate professor of physical education at the University of Toronto. UNB President and Vice-Chancellor Eddy Campbell applauds the gift. Student support is a significant part of UNB’s $110 million fundraising campaign, It Begins Here, which was launched in November. Fully one-half of the campaign goal – $55 million – will be dedicated to student financial support, funding scholarships, bursaries and programs to expand accessibility. Photo: Bob, Tim, John and Iris Bliss. Rob Blanchard photo.